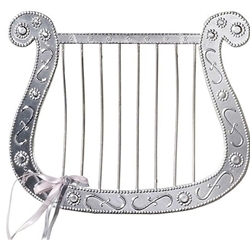 This gold angel harp is the perfect finishing touch to your angel costume. Pair it up with one of our angel costumes or any of our angel costume accessories to complete the angel look for Halloween or Christmas. The Angel harp is made of durable gold toned plastic and measures 9.5” tall by 10.5” wide. Please note that the angel harp does not play real music.